Our first news dump from the mags. Auto (VC) Limit Break 4: When this Unit’s attack hits a Vanguard, choose up to 1 of your (RC) “Star-vader, Infinite Zero Dragon”, Bind it face-up, then Ride that card at [Stand]. If you Ride, choose 1 of your opponent’s front row and back row Units each, and Lock them. Auto (RC): [Counter Blast 2 & Choose 1 card from your hand, discard it] When this card’s attack hits a Vanguard, if you have a “Star-vader, Infinite Zero Dragon” in your (VC), you may pay the cost. If you do, Bind this Unit face-up, then Ride this Card at Stand. 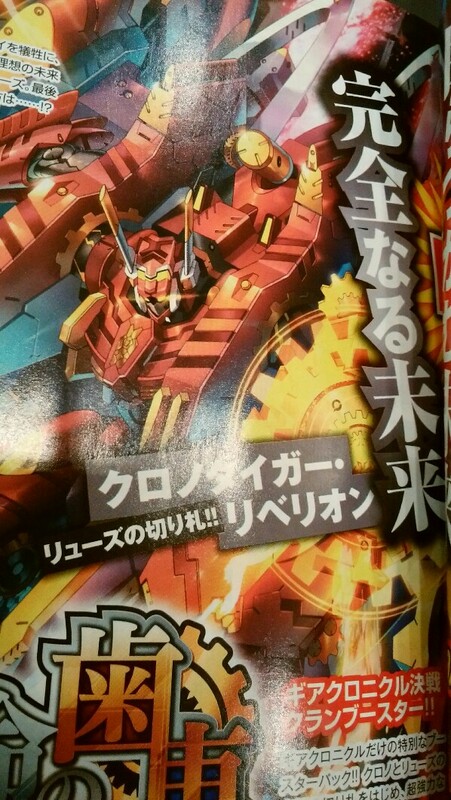 Auto (VC/RC) Generation Break 1: When this Unit attacks a Vanguard, during that battle, this Unit gets Power+4000. Continuous (Deck) Brave: This card gets Grade -1. Auto (VC) GB1 Brave: When this Unit attacks a Vanguard, during that battle, for each of your Grade 2 Rearguards, this Unit gains Power+5000. Auto: [Choose 1 card from your hand, discard it] When this Unit is placed on (VC), you may pay the cost. if you pay it, choose up to 1 Grade 2 card form your Deck, Call it to (RC), shuffle that Deck, and if that Unit has the Brave ability, when that turn ends, you can return that Unit to the hand. Bloom – Auto (RC) GB1: When another of your “Sunflower Maiden, Launy” appears in (RC), choose up to 5 of your “Sunflower Maiden, Launy” and/or “Summer Heat Flower Maiden, Marjukka”, during that turn, they gain “Cont (RC): For each of your Units with the Bloom ability, this Unit gains [Power]+1000.”. Continuous [RC/Deck] This card’s name is also treated as “Summer Heat Flower Maiden, Marjukka”. Bloom – Auto (RC) GB1: [Retire this Unit] When another of your Units with the same name as this unit is placed on (RC), you can pay the cost. If you do, choose up to 4 of your Rearguards with the same name, during that turn, they gain Power+4000. Auto (VC) [1/Turn] Generation Break 1: [Soul Blast (1)] When one of your Rearguards with the Bloom ability is chosen by your opponent’s card effect, you can pay the cost. If you do, draw 1 card. Auto GB1: When this Unit is placed on (RC) from the Drop Zone, during that turn, this Unit gains Power+3000 and “Auto (RC): When this Unit’s attack hits a Vanguard, Counter Charge 1 & Soul Charge 1”. Then, if this Unit is Hollowed, during that turn, this Unit gains Power+3000. Auto (Bind Zone): During the Start of a Guard Step of a Battle in which your Unit is attacked, you can Call this card to (GC). Cont (RC): If you have an “Infinite” Vanguard, for each of your opponent’s Locked Units in the same Column as this Unit, this Unit gains [Power]+2000. Auto (RC): [CB1] When your Grade 3 “Infinite” Unit is placed on (VC), you can pay the cost. If you pay it, choose 1 of your opponent’s units in the back row, and Lock it. Act (RC) [1/Turn] GB1: [Soul Blast (1?)] If you have a “Star-vader” Vanguard, choose 1 of your opponent’s Back Row Locked cards, that card, during your opponent’s next End Phase, cannot be Unlocked. If you chose 1, during that turn, this Unit gains [Power]+3000 and when that turn ends, this Unit is placed into the Soul. Cont (RC) Unite: If you have a Grade 4 or higher Vanguard, this Unit gains Power+3000. Auto (RC) GB1 Unite: When another of your Units is placed in (RC), choose this Unit and another of your Units in the same column as this Unit, during that turn, that Unit and this Unit gains [Power]+2000. Act (VC/RC) [1/Turn] Generation Break 1 [Soul Blast (3) – Normal Units] During that turn, this Unit gains [Power]+5000. If this card is in (VC), draw 1 card. Auto: When this card is placed from your hand to (GC), during an attack in which your Vanguard is attacked, choose any number of cards in your Soul, place them in the Drop Zone, then Call from the top of your Deck a number of cards equal to the cards placed in the Drop Zone by this effect to (GC). Auto (RC): During your turn, when a card is put into your Soul, this Unit gains 1000 Power until end of turn. Then, if the cards were placed into the Soul by the Revelation ability, this Unit gains 1000 Power until end of turn. Magia – Auto: [Counter Blast (1)] When this Unit is placed in (VC), you can pay the cost. If you do, choose 1 Grade 1 or lower card from your Soul with the Magia ability, Call it to (RC), when that turn ends, the Unit Called by this effect is placed into the Soul. Auto Generation Break 1: When this Unit is placed in (RC) from the Soul, during that turn, this Unit gains [Power]+2000. And if this Unit is placed due to the Magia ability, it gains [Power]+2000 during that turn. Auto Generation Break 1: When this Unit is placed in (RC) from the Soul, during that turn, this Unit gains [Power]+2000. Magia – Auto Generation Break 1: [Soul Blast(1)] When this card is placed in (RC) from the Soul due to the effect of a Magia ability, you can pay the cost. If you do, choose 1 card from your Soul, Call it to the same column as thi Unit, and when that turn ends, the Unit called by this effect is placed in the Soul. Magia – Auto (RC): [Place this Unit into the Soul] When your Main Phase begins, you can pay this card’s Cost, if you do, choose 1 Grade 2 or higher Unit from your Soul, Call it to (RC), then when that turn ends, place the Unit called by this effect into the Soul. Auto (RC): [Place this Unit into the Soul], when your Vanguard attacks, if you have a “Fenrir” Vanguard, you can pay the cost. If you pay the cost, draw 1 card, choose 1 of your Vanguards, it gains 5000 Power during that battle. Auto (RC): [Place this Unit into the Soul], when your Vanguard attacks, if you have a “Nightrose” Vanguard, you can pay the cost. If you pay the cost, draw 1 card, choose 1 of your Vanguards, it gains 5000 Power during that battle.